As I had to work on Sunday, there's no blog. Not much to show anyway, unless you're interested in one single sock that I managed to finish last week. So, I move the sock (and hopefully its partner) to next Sunday. The wife of a dear collegue of mine is pregrant. Though the baby was scheduled for November, it looks like the little lady is going to make a premature entrance to this world. I thought I'd get a bit more time, but when I heard the news I quickly got some yarn, a couple of patterns and wiped out a pair of baby booties. 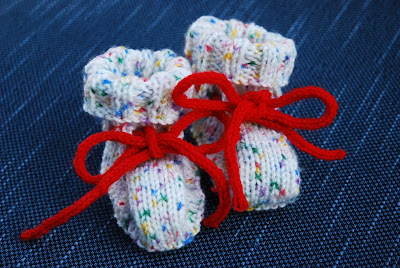 They were super easy to knit, fast and turned out very, very cute. 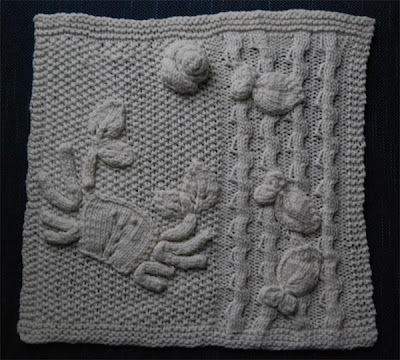 I do almost feel sorry that I don't have so many oppertunies to knit for babies. I also did knit a little baby hat, but didn't get a picture. Then, another collegue of mine is leaving the company end of the months. As she made the mistake to admire my simple, little flower bracelet last week, I made a bracelet for her too. The pattern I made up and it took me only two tries to get it the way I wanted it. Then I added Svarosky crystals to add some color and a bit of sparkle. I think it turned out nicely, and I hope she's going to like it. 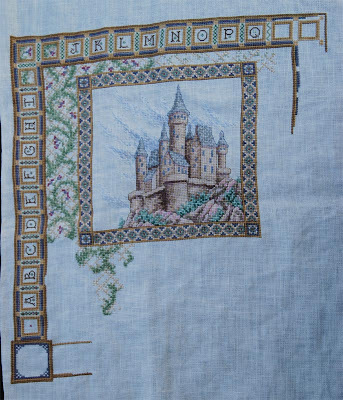 I took the Castle Sample with me last week to Dresden and worked mostly on the outside border. ...but, as I can't really afford diamonds, Swarovski crystals will have to do. Last week I've experimented a lot on beading and some related technics (like chain maille jewellery). As several of those experiments didn't yield satisfactory results, I've got only a little to show. First is a bracelet in black and white with Swarovski crystals on top. In reality it's very sparkly and I do love it dearly. The picture doesn't do it justice in a the least. Second is a set of bracelet and necklace. This is mostly normal beads with cheap glass crystals. 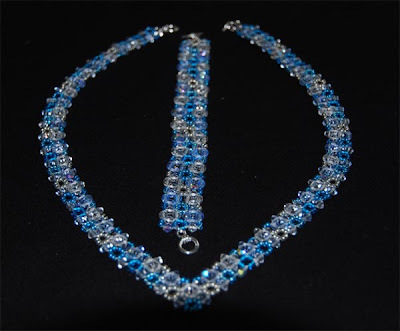 The necklace should have three rows, like the bracelet, but I did run out of crystals. I'm thinking about adding a pendant, but don't have any real idea at the moment what. Both pattern are from the magazine I've mentioned last time. 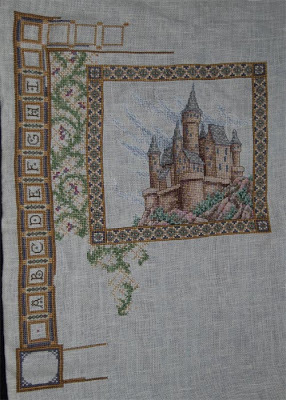 Other than beadwork, I've worked some more on the Castle Sampler. The left side is a bit narrow, and I probably will add a strip of fabric to extend it a bit for better manageability. At least I now know there's enough fabric for the pattern (I'm still short about 4 stitches, but there's just enough room for them). I didn't center the pattern very well, but this way I've got a bit more wiggling room on the right hand side. Sigh, my vacation is now over and it will be back to traveling most of the time. 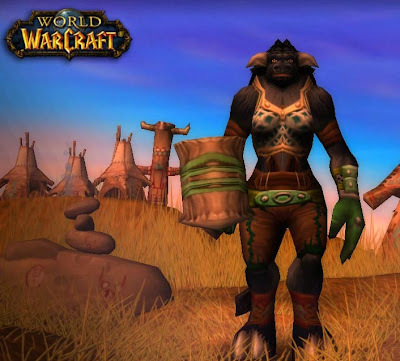 My character was a Taurus warrior, though I thought her to be quite cute. I thought it hilarious that when you type in the command "/muh", she actually moohed like a cow. Only, if anybody would have told her that face to face, she would have smashed him with her big hammer. ... though mostly on knitting. 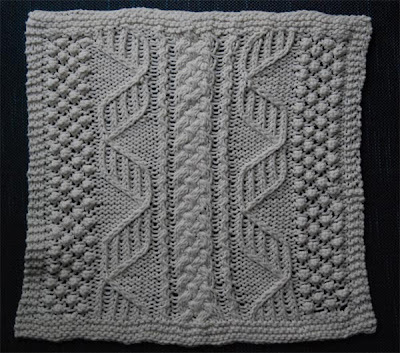 The pattern is (surprise, surprise) from Knitty and is called Ziggy. Many people have said it's difficult to knit with the Noro and even though I didn't have much problems so far, it is a different yarn to your standard run-of-the-mill sock yarn. But, the colors do absolutely make up for it. They are stunning in real and this pattern does show it off wonderfully. My first try on knitting a sock on a circular needle. Not sure if it will be my favorite way to knit socks, but I do like the look and the fact that there is a much smoother transition from needle to needle than with the double pointed needles. A bit of beading: really just a simple flower motives bracelet, but it took my a long time yesterday to figure it out. It's my own design, so I was making it up as I went. I'm pretty happy, though, on how it turned out. 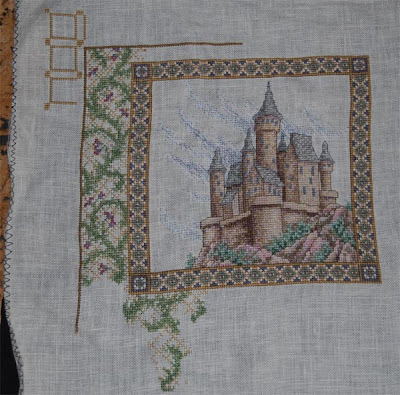 I did stitch some more on the castle sampler, but no update picture. Maybe next time. 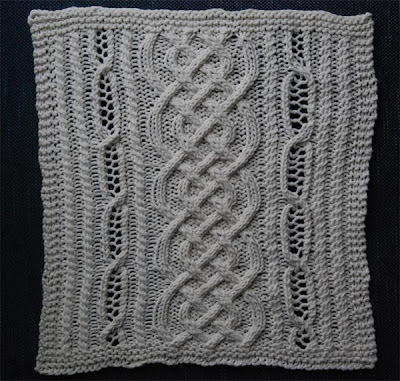 Update on the Great Aran Afghan project. I do knit on it occationally as it's a good project to carry with you when you go somewhere, or when you just find you're in the mood for some knitting. Block 14: (GAAA) designed by Dana Hurt: Not a particular exciting block and it ended up a bit on the loose side. Block 15: (GAA #4) designed by Celeste Pinheiro: Now, here's a fun block. The appliques were a bit on the fiddly side, but fun nonetheless. I did that one in Sweden, as I thought it appropiate being so close to the sea. I don't know what I do wrong, but everytime I did that left hand cross in the water bit always gives me that little extra wide stitch on the left side. It looks okay here because of it being the water and all, but I know it's not right and it does bug me a bit.